I found this recipe weeks ago and finally got around to making it last night. 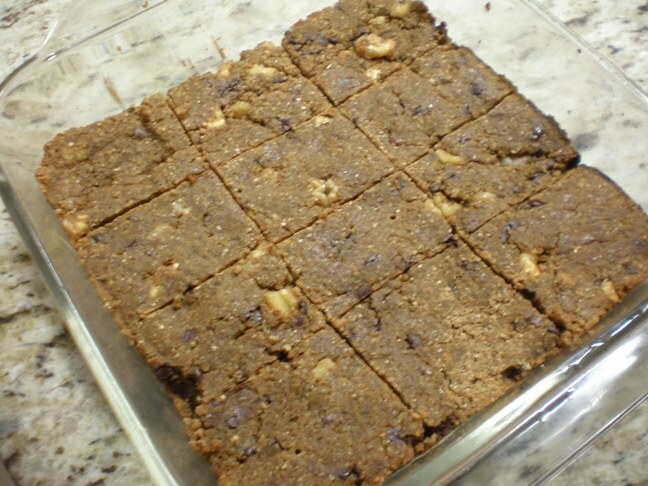 I made it exactly as written, using my chocolate brown rice protein powder and chopped walnuts and mini-chocolate chips as the add-ins. It was pretty easy though I had to use the dreaded food processor. The only issue I had was at the end when stirring the dough together. It was so thick that I couldn’t get the wet and the dry ingredients to mesh. I added a splash of milk and that helped. Then I mashed it down into the pan and baked as directed. Not bad. But looks don’t matter. It’s the taste that counts. Despite appearances, these tasted pretty good! I mean it’s not the best thing I’ve ever made and it doesn’t taste like a brownie, but it’s not bad at all. It’s definitely moist and not dry. I will say that it does taste like the protein powder I used. So make sure you actually like the protein powder you have if you’re going to use it in this recipe. I really like this concept of using quinoa in a bar-type snack. If I wasn’t concerned about protein I probably wouldn’t use protein powder at all. The author of the recipe says you can sub it with all flour or grind up some oats or nuts into a powder and use that instead. I am also wondering if I can skip the food processor part and just fold the quinoa into the dough. I may try that next time so I don’t have to wash that dumb thing. 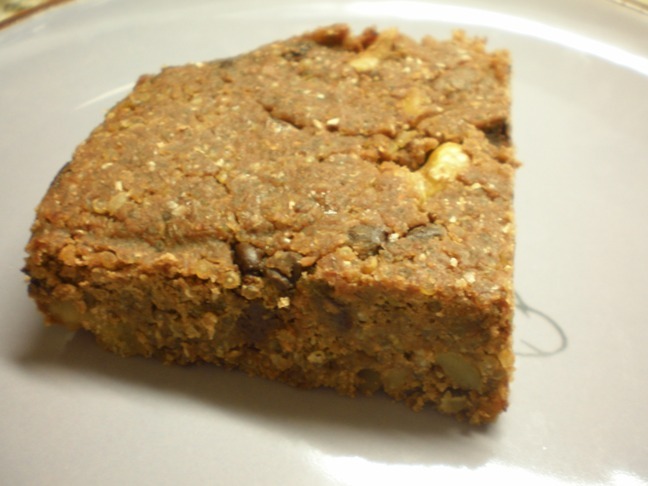 I had one of these bars for breakfast this morning along with a green smoothie. I’m going to take another one as a snack today. With only a few weeks to go until Baby Boy arrives, I may make up a pan of these bars to freeze as easy snacks I can pull out once he’s here (and I’m too exhausted to do anything). Breastfeeding moms need a lot of protein too, so this issue will be on my mind for awhile. Any other ideas for using quinoa? Send ’em my way!